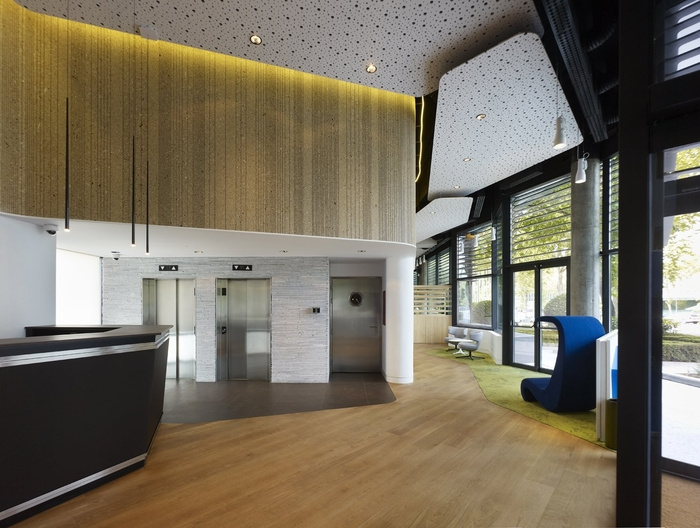 MVN Arquitectos has developed a new ground floor visitor center for global insurance firm Aegon located in Madrid, Spain. The aim of the proposal is the renovation of the existing space on the ground floor of the building and the creation of a new Flagship. AEGON brand values must be communicated in each corner to the workers and the visitors. The ground floor will be the new icon of AEGON, where office culture is exposed. It is a multifunctional concept that has been transformed into a visitor center which space is organized to offer company information and its products, where in addition it will be possible to set events, attend meetings, serve customers, take lunch or coffee, or just wait for someone. In order to meet this objective, in the lobby it is designed a multipurpose space susceptible of change according to the necessities, visual and acoustic privacy could be graduated with movable elements that go up and down without touching the floor to maintain visual continuity. The renovation not only affects the interior but also involves the facade, looking for an effective relationship between inside and outside, the facade becomes open and diaphanous in all level of ground floor.